Working in the restaurant industry is a popular choice among many people with a variety of skills in cooking, customer service, and business management. Although the field continues to thrive, it can be a challenge to find the right job. The best strategy to secure a job in this industry is to be ready with a strong resume and skills employers look for. Your knowledge and experience in the field may take years to develop, but creating a compelling resume doesn’t have to be as daunting. You can transform a mediocre resume into something amazing if you follow the top tips for this type of writing. First, check out as many examples as you can to see what works best. Then, look over our comprehensive writing guide and waitress resume templates to make your document the best it can be. 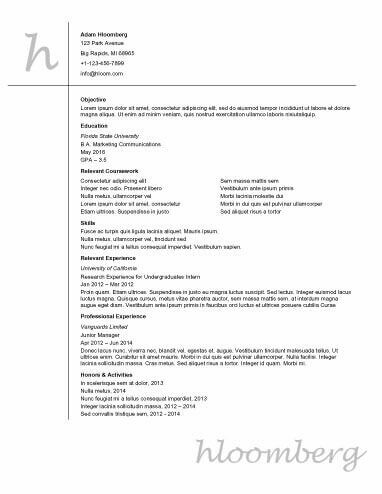 Why Use Waitress Resume Templates? The first rule of resume writing is to try your best to make yourself stand out among the competition. Doing so is sure to make it easier for hiring managers to notice what you could bring to the company. If you’re applying to the hottest restaurant in town, you may have lots of competition. One way to get your name noticed is to create a resume that is more creative. Waitress resume templates in this style focus on grabbing the reader’s attention. They also give you a way to organize your details in a unique fashion so you don’t look like every other applicant vying for the job. Some restaurant chains and unique concepts may appreciate candidates applying with a resume in the contemporary style, which goes beyond the basic format and gives applicants a little more creative room to show off their unique style and personality. Designs look sleek, modern, and ready for the digital age. Most of all, a contemporary resume could help you demonstrate your individuality. Many people going for their first job begin looking in the restaurant industry. If you’re putting together your resume for the first time, you should start with the one-page format. Waitress resume templates that are one page focus on the candidate’s educational experiences and short work history. While you have a brief resume, you can create winning details that stand out. It’s important to keep your resume professional. With the professional waitress resume templates and writing tips, you can count on getting the most professional-looking documents that wow employers and get interviews quickly. This means avoiding heavy graphics, distracting fonts, and amateur mistakes. A resume that doesn’t follow the restaurant industry’s professional guidelines could be set aside and forgotten. basic and simple format for your resume. Busy hiring managers appreciate getting all your information in a succinct and organized document. This format presents your information in a well-put-together and logical fashion, making it easier to digest and understand. A professional resume should begin with your basic contact information, such as name, phone number, and email address. Don’t worry about including your full mailing address; you only need your city and state. Some professionals should include their social media links or professional portfolio details. Wow hiring managers by including a strong summary statement or objective after your contact information. A summary statement should provide a compelling overview of what makes you the top candidate in the industry. Summary statements can include proud achievements, special skills, and talents. Objective statements are best used for entry-level applicants or people looking to change careers. You can help give your document a better chance of getting selected by an applicant tracking system with a focused list of skills. Include about four to six skills related to the industry, such as customer service, math, food knowledge, and wine pouring. Avoid including skills not related to food service or customer relationships. Organize your work history by date, beginning with the most recent. Avoid listing each responsibility and focus on pointing out accomplishments. Include information that demonstrates your commitment to excellence, such as promotions and more responsibility. Only present details relevant to the restaurant industry. List your top educational experiences, starting with the highest level. Recent graduates can include more details, such as clubs and organizations. Give information about awards and scholarships, if you have any. Creating a resume that gets attention and helps you secure a potential interview is much easier if you get help from our resume builder. Jobseekers looking for work in the restaurant industry can take advantage of this powerful tool along with the detailed waitress resume templates to make a winning document. Size up your resume to other samples from the industry to see if you are right on target. Revamp your resume with a stunning new design sure to catch the employer’s eye. Find the exact word or phrase to use that helps you get the job. Get help with creating the right electronic format for your resume so you can quickly post or email it.